Scroll down to the bottom of this page to download 3 free handouts you can put to use immediately. In addition you can subscribe to my free e-magazine, Get Paid MORE to Speak. if all this is true about you, then I am thrilled to invite you to be a part of what I consider one of the most powerful speaker education program ever created: The Speaking for Money Coaching Program. In it you will find the most content (80 videos with associated audios and pdfs) presented in the most easily and conveniently absorbed manner that can be reviewed as often as you would like. You will discover your next best steps towards your greater success as a paid speaker and tools and techniques you will find useful for years to come – all for the price of what you should most likely be receiving for one talk! 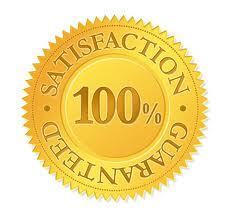 Here is just a taste, a sample of the quality material you will receive in this program. This is just one of the more than 80+ videos you will have available to you, along with audio, transcriptions and handouts. This 23 minute video is the 10th video in Module #4 where Steve and I talk about a presentation I had just given to his staff that morning. We cover how I used a one page handout as a powerful marketing, teaching and audience engagement tool and how you can too. Download “Rob’s Handout” that Steve and I discuss, print it out and follow along while viewing this video. In the full module I show you how you can take a one page handout like this and expand it into a 30 page training manual!! There is so much value in every video and every worksheet and handout of every module in this program, you will be amazed at all that is included. As you will see below – We guarantee it! Clearly I believe The Speaking for Money Coaching Program is the most content rich, insider secret laden, practical step-by-step action plan for developing your speaking business in the quickest time frame that I know. In 1992 I created a seven month training in How to Become a Professional Speaker that was great for the time. Since then I have been Dean of the National Speakers Association Houston’s 10 month Speaker Academy three times, which was even better. But this new program is unique in the range and depth and speed with which you can acquire a vast amount of information from a faculty of powerfully successful speakers – all in the convenience of your own phone, computer and home. I joined together with Jack Canfield, author of the internationally acclaimed Chicken Soup for the Soul book series, the most successful author/speaker in history; and Steve Harrison, absolutely the most successful speaker/trainer on how to get publicity for yourself, your book and your services; as well as an impressive faculty of other highly successful speakers, all of whom consistently make a six figure income to create this new online Speaking for Money Coaching Program. I know this sounds like a tall order but this is a guaranteed offer. If after the first 3 modules (out of eight!) you are not completely convinced that this is way more valuable than the cost, you will receive all the benefits of those three modules AND your money back! You can not loose. But wait — there is more… You will have the opportunity for many hours with ME as your Coach! I conduct the weekly group coaching call along with other members of the SFM faculty where you can ask any question about how to stay focused on what is your best next step towards success in the speaking business. I want to make sure you get the most out of applying the many tools and techniques of this course, customized to your unique needs. So in addition to all the many videos and handouts involved in each module, some with me sharing my secrets of success, and participating in the 8 live group coaching calls you will also have access to recordings of these group coaching calls (whenever you can not make it or to listen and review) with me co-hosting most all of these group coaching calls with Steve, Geoffrey, SRenee, Jason and other faculty members. if you sign up through the links on this page and only through these links, I will provide you with 2 additional 30 minute individual coaching sessions for FREE. I believe there are so many overwhelming benefits, tools, techniques, and insights in this collection of materials that I encourage speakers whom I coach to take advantage of this offer to grow their speaking careers. 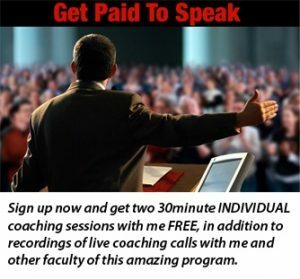 I have no doubt that in a few months this remarkable Speaking for Money Coaching Program will provide you the knowledge required to take your understanding of what is needed to be a more successful speaker further than you ever imagined possible. who is committed to making a difference in the world and feels called to work with me individually as your coach while you benefit from the overwhelming number of success secrets shared by all the other coaches within this amazing program, then go to: Speaking for Money Coaching Program get a full overview of all the many benefits that are contained in this offer and sign up! When you have completed that process, complete my online coaching application and sign up for your first of two thirty mintue individual coaching sessions by going to my TimeTrade account to schedule our first appointment. And send me an email letting me know you have signed up and completed my application. And remember, if by the 3rd module you do not believe this is completely worth the price, then you have your money back guarantee. This is an offer that is hard to beat. You can begin now by downloading three content filled handouts for free from a series of teleseminars I did in the spring of 2013. Based on the success of this program Steve invited me to help create the Speaking For Money Coaching Program. The testimonials down the righthand side of this page are all from people whose speaking careers have benefited from our work together. I look forward to seeing you listed there as well. If you would like access to the audio recordings of these teleseminars send me an email. Of course I can not guarantee the results you will produce. But I can guarantee I will share with you the tools and techniques I have used to consistently generate a six figure income every year since 1982! I look foward to making your next speaking steps easier to define and quicker to take. P.S. Since I helped created this program, if you sign up through this page and are not already in Steve’s database I will receive a commission. Rob Pennington coached me on how to give a great keynote. In addition to improving the talk’s flow and design, he advised me to go early and make friends so I wouldn’t be so nervous. I was the most comfortable I’d ever been on stage. At the end of the talk, 50% of the room rushed to my table. They bought my book and sign up to find out about my coach program. It was a highlight of my year to be so well received because I was really a novice. I ended up with $18,000(!) in sales from that talk, which I would have passed up before because they were only paying expenses. Using Rob will make you money! I have heard several of the top speaker trainer’s seminars and info products and none of them gave me the information that I received in Dr Rob’s first teleseminar! I have never heard any speaker be so thorough and generous with actual ways to find speaking gigs. Dr. Rob is an invaluable ally for anyone interested in being a successful professional speaker. He’ll show you the ropes, share secrets you won’t find anywhere else, and support you in getting where you want to go. In a short time, I learned so much from him! Every time I talk with Rob I produce pages of notes and a brain overflowing with exciting new ideas. His excellent questions help me take one idea and extrapolate it into a windfall of possibilities! Brilliant, generous and successful he is a master at helping match my talents and strengths with those of my ideal clients. If you are a speaker, you need to know Rob. Rob’s speaking program was really helpful. I especially appreciate all the actionable advice. I feel like I know what to do next in creating a plan and moving forward.